Once a web site visitor completes any Virtuous form (Donation Form or Lead Form), you have the option to have Virtuous automatically send an email to confirm the form submission (Lead Forms) or thank a donor for a gift (Donation Forms). Because these submissions may be received from people who are not yet listed in Virtuous, the Form Confirmation Email is designed to use specific merge fields, which is why this email type is set aside from other email that may be sent to existing Virtuous Individuals. To create a new Form Confirmation Email, navigate to the Email page in Virtuous Marketing. To access Virtuous Marketing, look for the three dots in the upper-right corner of the screen, and click to switch from Virtuous CRM to Virtuous Marketing. 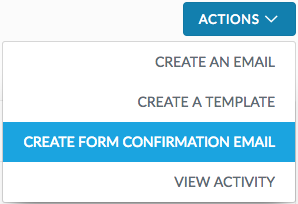 Click on the Actions drop-down in the upper right and select "Create Form Confirmation Email" to start the creation wizard. The email editor is the same as the email editor used for creating Virtuous Marketing emails. On the right, there are three tabs to navigate among the various toolbars. On the Content tab, click and drag any of the various content sections, like Text Blocks and Images, to include them in your email. Use the Rows tab to switch the default, single-column layout to a two- or three-column layout, allowing you to add multiple content blocks side-by-side. On the Settings tab, you can configure design settings and defaults, like the font selection, background color, and content width. Once you have made changes to your email, click on the Actions menu and select "Preview" to see how your email will look to recipients. Choose "Send Test Email" to be able to view the email in your inbox. When sending a test email, it's important to note that merge fields will still appear as merge fields, and will not be replaced with sample data. Save your email and publish it in order to use it in Virtuous. Once your email is saved and published, click "Back to all Emails" in the upper left to return to the main email screen. To use your Form Confirmation Email, select it on the Submission Tab when editing any Donation Form or Lead Form.